This is an issue that almost all my patients are concerned about – whether they have come to me to help them prepare for a healthy pregnancy, or if I have helped them get pregnant naturally and are now concerned about maintaining a healthy weight during their pregnancy. Latest research shows that babies born to overweight or obese mothers, are more likely to become overweight or obese than those born to normal-weight mothers. And a Swedish study warns that a BMI in the overweight and obese reference range is associated with a higher risk of having babies with serious birth defects. The sensitive period of foetal organ development is the first 8 weeks of pregnancy and it is in particular during this time that BMI may have a negative impact. Researchers have also discovered that a link between the presence of microbiota in the infant gut appears to be reflected in maternal and child overweight status, particularly in cesarean-delivered babies. Am I really supposed to “eat for two”? Are my cravings a sign that my baby “needs” me to eat those foods? Should I be “snacking” on lots of carbs between meals to prevent morning sickness? Should I go on a calorie restricted diet during my pregnancy so that I don’t put on too much weight? 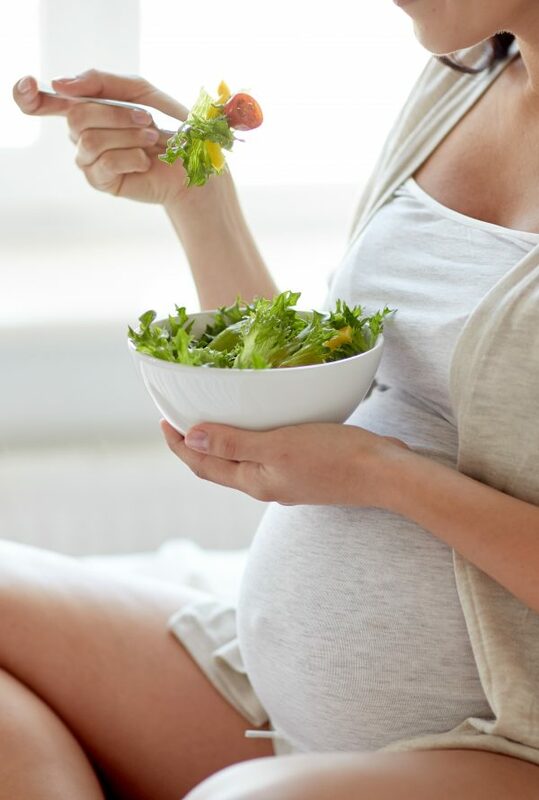 During pregnancy your body becomes extremely efficient at absorbing more of the nutrients from your diet – so eating for two doesn’t double your chances of a healthy baby. Rather, eat more nutritious food (ideally, before you get pregnant), and certainly throughout your pregnancy. There is no evidence that cravings are a sign that your baby needs you to eat those particular foods. It is more likely your baby is ‘needing’ more of the nutrients that might be hidden in those foods. I often tell my patients to try to listen to their body and work out what healthy nutrient might be hidden in the food they may be craving. And then rather consume the healthy alternative. For example, if you are craving chocolate, your body (or the baby) might be ‘needing’ more calcium (from the dairy) and more magnesium (from the cocoa). So it would be much healthier to substitute that chocolate for the real, natural source such as milk / yoghurt and green leafy vegetables/whole grains/ nuts/seeds/avocado/banana – just to name a few. Sugar cravings can be blamed on the mother’s sweet tooth! There is nothing healthy that is hidden in cane sugar or any food that has been processed. Snacking on small portions of nutritious ‘healthy carbs’ such as whole (unprocessed) grains, veggies and fruits between meals would help prevent nausea during pregnancy. However, it’s advisable to always combine these with some healthy proteins such as nuts, seeds, tofu, eggs, yoghurt, hummus, tahini, meat, fish, chicken to slow down the absorption, maintain healthy glucose levels and prevent the nausea returning too soon. Go on that calorie restricted diet BEFORE you get pregnant. You should definitely NOT go on a calorie restricted diet during pregnancy. If you are overweight and wanting to get pregnant, it would be much wiser (and healthier for both you and your baby) if you went on that calorie restricted diet BEFORE conception. Your baby needs essential vitamins and nutrients to grow and develop in the healthiest possible way while you are pregnant. Being over or underweight during your pregnancy can therefore affect the health of your growing baby as well as increase complications during pregnancy and labour. I hope I’ve given you more of an understanding of how to listen to your body’s cues so that you can make wise and healthy choices for a healthier pregnancy outcome.